"BaDerech, Newspaper of the Illegal Immigrants aboard SS Empire Rival – a Ship of the Famed British Navy, Etched in our Hearts for Eternity in Disgrace". Created by: representatives of the immigrants and Haganah members; location of the editorial board: the ship's cellars. [July? ]-August 1947. 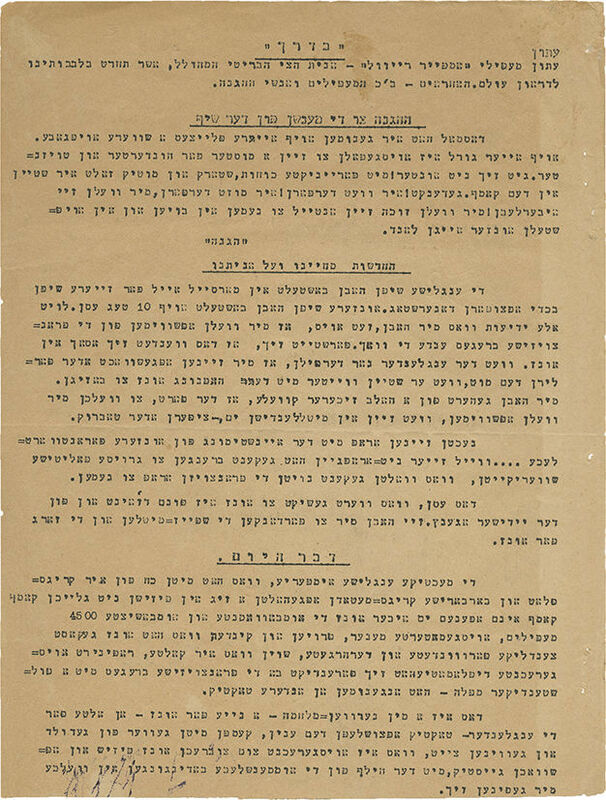 Yiddish, headlines in Hebrew. Two issues of a newspaper, typewritten by passengers of SS Empire Rival and mimeographed in the ship's hold at sea. The Empire Rival was one of three ships to which the passengers of the Exodus were transferred at Haifa Port on July 18, 1947, after their entry into Palestine was refused. Apparently, no other issues were printed. First issue: 5 leaves (detached from each other), second issue: 4 leaves (detached from each other), 25-29.5 cm. Good condition. Stapling holes and a few small tears to margins (some reinforced with adhesive tape). Folding marks and minor blemishes. One leaf has an open tear at the lower right corner.